There are already thousands of Munroists, and will no doubt be thousands more. There are certainly many common underlying threads, and both past and present cohorts in this endeavour will nod knowingly when contemplating all that’s involved: submitting to Mother Nature’s temperament, whether the weather, river crossings, bog slogs, or wee beasties; the effort and expense demanded to reach those far-flung hills; fiendishly early starts and ridiculously long days. But I daresay that with a few rare exceptions, each person’s route to the finish line is as individual as the person him- or herself. There’s nothing particularly remarkable about this story, but it is mine. It took nearly 8 years to knock off the first 50. I was content to visit a few straightforward and close-to-home ones on my own each year, usually in the spring. My initial goal, in the wake of a relationship breakdown, was to reach 20 or so, a comfortable few more than the number acquired by my ex; he’d always taken great glee in lording his larger total over me. We’d summited several together, but I’d always been more of a long-distance girl than a climb ev’ry mountain girl. Heading for the hills got me out of the house and gave me something to focus on besides my heartache. It never occurred to me then that I might want to, or be able to, do this thing called “compleat.” I’m not even sure I knew what it meant, and wondered, with some exasperation, why so many insisted on misspelling it. I ramped up in 2014. It wasn’t planned, but in a year bookended by loss, the “life is short” message may have played a part. In early January, my friend Jane died following a long illness, during which she never lost her courage, her wit, or her smile. Nary a tear was shed, nor was there ever a “why me” moment of pity. She was, and remains, an inspiration to me. 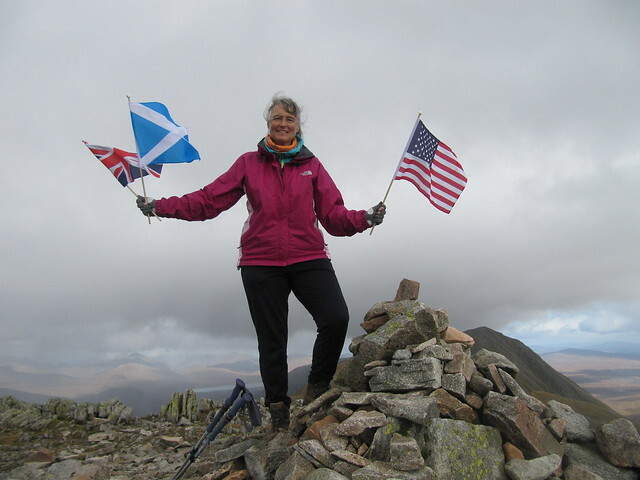 Although she was a hill-bagger herself, we only shared a couple of jaunts—she’d head out in the company of her hillwalking group, while I preferred to be on my own, or with a smaller group. But we’d taken many local walks together, sometimes as often as several times a week; she was always the kick up my backside when I’d have happily stayed inside instead. In March 2014, I went to my first WH meet, at Inchnadamph. I’d signed up for it months in advance, and became more and more nervous as the time approached. Facing a crowd of people I’ve never met before—most of whom already knew each other—on my own? As an introvert, that’s pretty much my idea of hell. In the hope of breaking the ice, I’d responded to a thread in the meetup forum; my introduction to Walkhighlanders would be a long and boggy, though river-crossing-less, plod up Am Faochagach from the Glascarnoch dam. Pete and Andy and I shared a wet, cold, and challenging day that was not rewarded with views from the top! •	Try to be good company—both interestED and interestING. •	Always smile for the photos. •	There’s no crying in hillwalking. I lost my mum in November that year, my grief compounded by not making it home in time to say goodbye. I was out of action for several months, until a snowy ascent of Ben Ledi on a spectacular blue-sky day in early 2015 reminded me once again of the great healing power of the hills. The years in between my slow start and the finish line (2015–2017) offered many choices, and it wasn’t hard to rack up impressive statistics. I could go nearly anywhere, often following the weather, and bag at least a couple of hills, usually in a day trip. 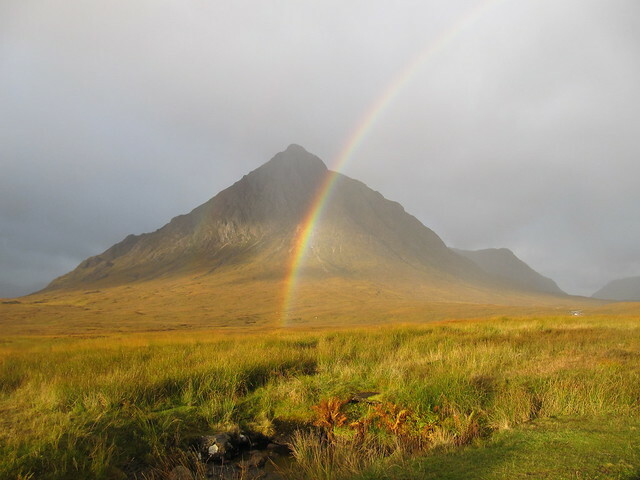 Two guided trips to Skye—I’m such a wussy that I’d never have managed the Cuillins without a great deal of support. More than a few Cairngorm adventures—including one wet, wild, and windy saga that lasted 17 hours, covered 42km and 5 Munros, while carrying a ~14kg rucksack and suffering a dicky tummy. (Perhaps not surprisingly, this became the one by which all others were measured.) 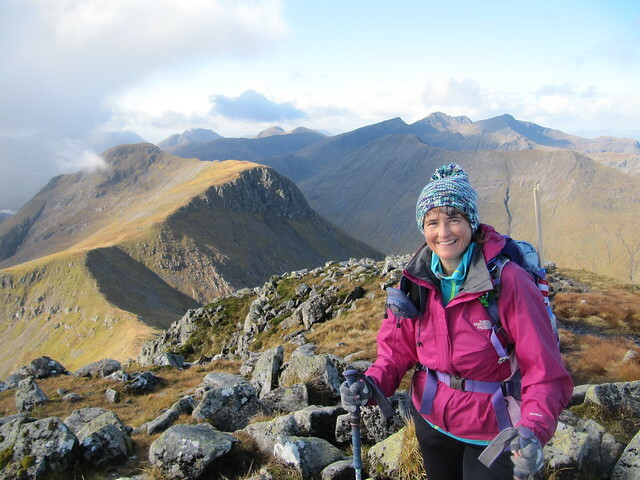 That one perfect week in June 2016 wherein the CMD Arête was traversed on a magnificent sunny day, #200 was ticked, the Knoydart Munros were crossed off the to-do list, and Skye—including the In Pinn—was tidied up. Somewhere along the way, it first became possible, then nearly inevitable, that barring any unforeseen events, I’d eventually get to them all. There were complex emotions in play as The Count wound down. I was keen to finish; at the same time, I wasn’t. Once they’re done, they’re done. Oh, I know all the arguments—I can always do repeats, on better days, or via different routes, and enjoy them every bit as much, or even more. And there’ll always be new hills to climb, and other goals to set. But you’ll have a hard time convincing me that anything else can quite compare to finishing the granddaddy of (Scottish) lists. It was more important to me to finish on a good day with several of my nearest and dearest than to schedule a grand hoo-ha months in advance and take my chances with the weather. My staunchest and most frequent walking pals over the past couple of years have been Jimmy, Evie, and David. Even at short notice, and without a cast of thousands, it proved impossible to find a date that suited all four of us—sadly, David was unable to come along due to work commitments. For Jimmy, Evie, and I, there was a lot of last-minute finger-crossing that the weather would be OK; it was October, after all. 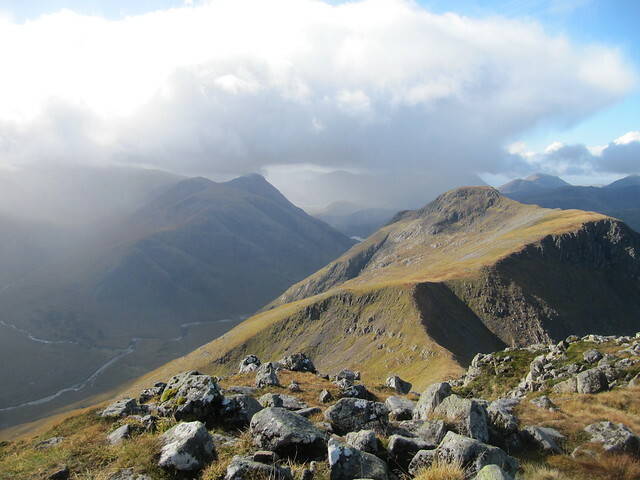 We set off from Altnafeadh in showers, and indeed there were snow showers on and off throughout the day, but there were also moments of brilliant clarity, blue sky, gorgeous autumn colours, and stunning views. 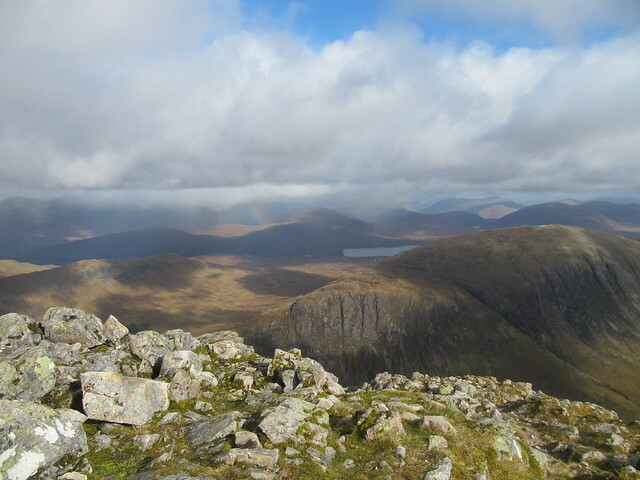 We had a small celebration at the top—thanks, Evie, for the dram and the yummy lemon cakes!—and took many daft photos. I was a happy girl – it was all I wanted, and more. 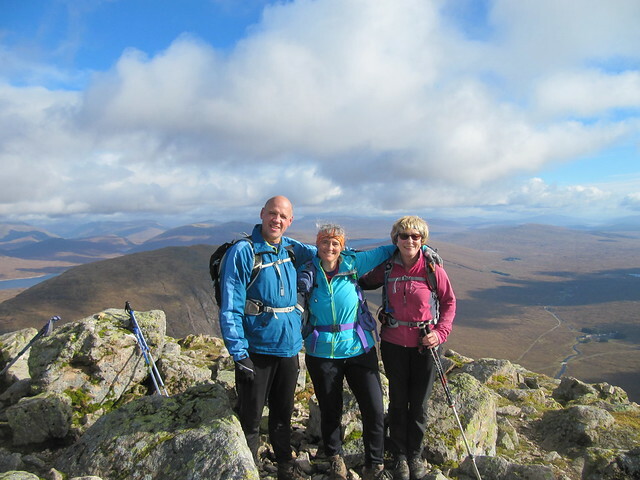 There are tons of walk reports for Buachille Etive Mor, and we followed the WH route to the letter, so I won’t bother to detail any of that, and just add a few photos. This journey has tested me in many ways: physically, mentally, emotionally, logistically (end-to-end walks involving multiple cars leave me utterly befuddled—just tell me where to park and whether to take my car key ). It’s required a lot of organization—something I’ve always been good at (aforementioned logistics notwithstanding), and just as much flexibility—something I’ve never been good at. It’s been more about being determined and stubborn than being uber-fit. I’ll never win any speed records, but I will get there, eventually. I’ve reluctantly had to accept that cycling and camping aren’t for me, although I’m glad I can say that from experience, and not simply by assumption. Forty-odd years of being a decidedly non-sporty bookworm before beginning this venture took their toll. I’ve had a few scary moments, some miserable hours, and, in spite of my resolve, there’ve been a few tears along the way. But it’s also given me memories to last a lifetime: too many jaw-dropping views and “wow” moments to count; many laughs and hours of good craic and pure entertainment; several enduring friendships; ample opportunities for quiet reflection and solitude; feeling as though a hill belongs to me, and only me, if only for a moment; saying (or thinking), “oohhhh…that was SUCH a good day” whilst hill-spotting from various places; the satisfaction of getting “there” and back safely; watching the number of red balloons diminish as the blues began to dominate; seeing places and having views that 99% of the world’s population haven’t and won’t; becoming familiar with remote corners of Scotland that I’d never otherwise have visited; learning how to be Zen about those terrible 10 miles of A82 between Inveraran and Tarbet. The list goes on. Over the past weeks, I’ve compiled a “movie” of my highlights, milestones, and most memorable outings. Trawling through thousands of photos to pick the most representative, and trying to find the right music to accompany them was time well spent, and provided a great opportunity to reminisce. If you’ve been around WH for a while, you might recognize a few of the faces; if not, you’ll most certainly recognize some of the places. Re: They called, I went. Oh no! It says "This video is unavailable" Congratulations on finishing the Munros. Your report gives a true idea of what they meant to you and mean to so many of us. You are right about the healing power of hills. A wonderfully poignant account of your journey Karen and what it means to you and probably most people who undertake the same journey in their own way. May the mountains continue to give you inspiration and solace for many years to come. Some lovely words, emotional but with a sense of humour and a joix-de-vivre that shines through. Congratulations on finishing you Munro journey. I'm avoid the "compleat/complete" phrase deliberately, for I don't believe for a minute the hills are over with for those who reach every summit. That's a lovely story, and the vid is great (recognised lots of the wonderful places). On reading testimonies like this, I always think: truly, we are the lucky ones. Congratulations. A tremendous achievement, great report and video. Well done and all the best on your continuing journey. Name checked on a compleation report 😁 Congratulations on your achievement and for saving it for a day of fine weather. Glad you got a good day for it. Now time to get cracking on those corbetts! A beautifully written report and moving life story. Congratulations! May they keep on calling...congratulations kmai1961. OK, so there might not be any crying in hillwalking, but none of my rules say I'm not allowed to get a bit emotional whilst reading so many nice comments.